Want a scary novel to read this fall? 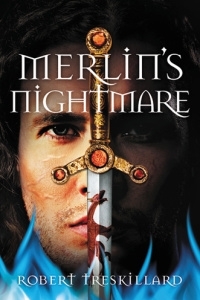 Yes, you can win a FREE author signed copy of MERLIN’S NIGHTMARE! While the book isn’t horror, you may expect a few chills as you read the novel with a flashlight while hiding under the covers! Arthur, now eighteen, is missing, and Merlin must find him before a shadowy pursuer catches him first. With the high-king and his kingdom caught in a trap of sinister deceit, Merlin has to find a way out before all is lost. Having everything to fight for, and almost nothing to fight with, Merlin and Arthur must rally Britain’s warriors against three overwhelming enemies: Saxenow hordes in the south, Picti raiders in the north, and a chilling new enemy that has arisen in the west. Mórgana brings Merlin’s deepest fear to life and sets it loose to destroy Britain. But when the secret purpose of this nightmare is finally revealed, will Merlin and Arthur find a way to survive—without unleashing an even greater evil? Appropriate for all youth ages 13 to 113 … at least as long as you don’t mind a bit of violence per the era as well as some scary situations! Completely clean and family friendly otherwise. Giveaway ends November 13, 2015. This entry was posted in ** THE MERLIN SPIRAL **, 3: Merlin's Nightmare, GIVE-AWAYS, My Novels. Bookmark the permalink. Just to let everyone know, the winners have been selected and notified, and the books will be mailed out shortly!